Information derived from AFPAM36-2241V1 and Air Force Instruction 44-121. Members of the Air Force are held to the highest standards of discipline and behavior, both on and off duty. 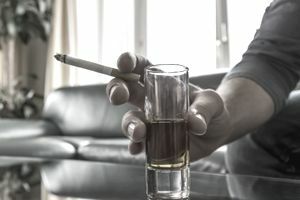 Individuals who experience problems related to substance abuse (SA) will receive counseling and treatment as needed; however, all Air Force members are held accountable for unacceptable behavior. Air Force policy is to prevent drug abuse among its personnel. Failing this, the Air Force is responsible for identifying and treating drug abusers and disciplining or discharging those who use or promote illegal or improper use of drugs. The Air Force has an integrated set of policies and programs that have evolved over 20 years for substance abuse to help with the prevention and the treatment of SA. The Air Force Alcohol and Drug Abuse Prevention and Treatment (ADAPT) and Demand Reduction (DR) programs include substance abuse prevention, education, treatment, and urinalysis testing. Promote readiness, health, and wellness through the prevention and treatment of substance misuse and abuse. Minimize the negative consequences of substance misuse and abuse to the individual, family, and organization. Provide comprehensive education and treatment to individuals who experience problems attributed to substance misuse or abuse. Restore function and return identified substance abusers to unrestricted duty status or to assist them in their transition to civilian life, as appropriate. Drug abuse is defined as the wrongful, illegal or illicit use of a controlled substance, prescription medication, over-the-counter medication or intoxicating substance (other than alcohol) or the possession, distribution or introduction onto a military installation of any controlled substance. “Wrongful” means without legal justification or excuse and includes use contrary to the directions of the manufacturer or prescribing healthcare provider (prescription medication may only be taken by the individual for whom the prescription was written) and use of any intoxicating substance not intended for human ingestion (for example, inhalants such as markers, gas, paint, glue, etc.). Air Force members are also prohibited from possessing, selling, or using drug paraphernalia. Illegal or improper use of drugs by an Air Force member is a serious breach of discipline, is incompatible with service in the Air Force, and automatically places the member’s continued service in jeopardy. The Air Force does not tolerate such conduct; therefore, drug abuse can lead to criminal prosecution resulting in a punitive discharge or administrative actions, including, separation or discharge under other than honorable conditions. Steroids are synthetic substances related to the male hormone testosterone. These substances have two effects: the androgenic, which causes the body to become more male, even if the user is female; and the anabolic, which builds tissue. The illicit use of anabolic steroids by military members is an offense punishable under the UCMJ. Air Force personnel involved with steroids will be treated in the same manner as with any other illicit drug use. The Air Force recognizes alcoholism as a preventable, progressive, treatable, and noncompensable disease that affects the entire family. Alcohol abuse negatively affects public behavior, duty performance, and/or physical and mental health. Air Force policy is to prevent alcohol abuse and alcoholism among its personnel and their family members. Air Force members must always maintain Air Force standards of behavior, performance, and discipline. Failure to meet these standards is based on demonstrated unacceptable performance and conduct, rather than solely on the use of alcohol. Commanders must respond to unacceptable behavior or performance with appropriate corrective actions. Is observed, identified or suspected to be under the influence of drugs or alcohol. Receives treatment for an injury or illness that may be the result of SA. Is suspected of abusing substances. Is admitted as a patient for alcohol or drug detoxification. Unit commanders must refer all service members for assessment when substance use is suspected to be a contributing factor in any incident, such as reporting to duty under the influence, public intoxication, driving while intoxicated (DUI or DWI), spouse or child abuse and maltreatment and others. The Air Force conducts drug testing of personnel according to AFI 44-120, Drug Abuse Testing Program. All military personnel are subject to testing regardless of grade, status or position. Military members may receive an order or voluntarily consent to provide urine samples at any time. Military members who fail to comply with an order to provide a urine sample are subject to punitive action under the UCMJ. Commanders must refer individuals identified positive as a result of drug testing for a SA assessment. Results of any examination conducted for a valid medical purpose including emergency medical treatment, periodic physical examination and other such examinations necessary for diagnostic or treatment purposes may be used to identify drug abusers. Results may be used to refer a member for a SA evaluation, as evidence to support disciplinary action under the UCMJ, or administrative discharge action. These results may also be considered on the issue of characterization of discharge in separation proceedings. Air Force members with SA problems are encouraged to seek assistance from the unit commander, first sergeant, SA counselor or a military medical professional. Self-identification is reserved for members who are not currently under investigation or pending action as a result of an alcohol-related incident. Placed under investigation for drug abuse. The day and time when a member is considered “placed under investigation” is determined by the circumstances of each individual case. Ordered to give a urine sample as part of the drug-testing program in which the results are still pending or have been returned as positive. Advised of a recommendation for administrative separation for drug abuse. Entered into treatment for drug abuse. Self-identified members will enter the ADAPT assessment process and will be held to the same standards as others entering SA education, counseling and treatment programs. Separation or discharge based on substance abuse may be recommended by commanders. A recommendation is based on documentation that reflects a failure to meet Air Force standards. Discharge may be recommended if a member with an alcohol problem refuses to take part in the ADAPT Program or fails to complete treatment successfully, though unsuccessful completion of the ADAPT Program cannot be based solely upon failure to maintain abstinence if abstinence has been established as a treatment goal or requirement.